This cub is going scout hunting. The projectors are about to start rolling at the 2014 Toronto International Film Festival and one of the films that looks to steal the show at the Midnight Madness program is Jonas Govaerts’ feature film debut Cub. With the release of a wicked new trailer and its World Premiere just around the corner, there is now a huge spotlight shining on the once under the radar thriller that hails out of Belgium. The film sees a handful of cub scouts quickly realize that all of those long nights of singing folk songs around a campfire and their new found self-confidence wont save them once a savage child starts to tear them apart in the woods one by one. Horror in the woods is certainly nothing new but Govaerts smartly spins a new focus on the genre as he pits children against a feral child who sets deadly traps in the forest. 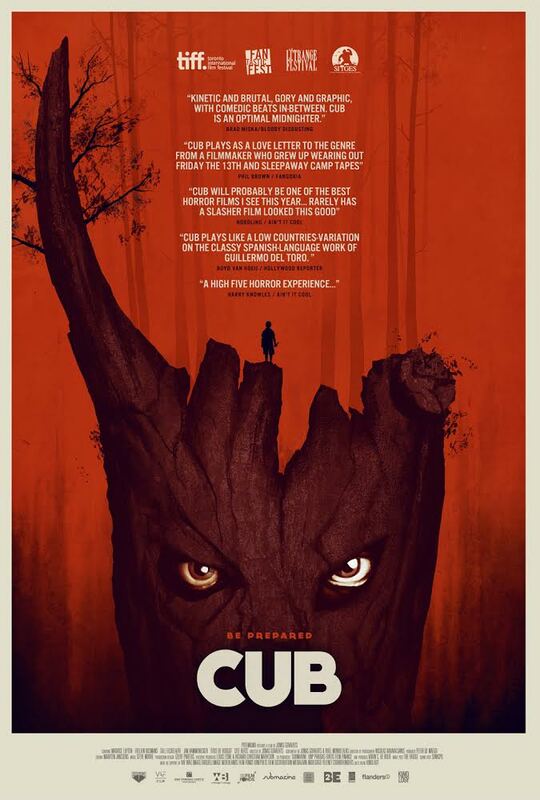 The trailer is fantastic, giving us a great look a Govaerts’ cub scout slasher that looks to have been inspired by the horror films of the old school variety. Nobody wants to get shanked while wearing a felt cap, and I mean nobody. Troubled twelve-year-old Sam (Maurice Luijten) heads off on a summer camping trip with his Cub Scout troupe. When the highly imaginative boy claims to have seen a creature in the woods, his counsellors naturally assume that their campfire tales of a monster named Kai have gotten to him. But the danger Sam sees is all too real: watching from the darkness is a masked, feral child whose menacing snarl and quick movements go unnoticed by all except for Sam. As the mocking taunts of the other boys isolate Sam further from his pack, he becomes increasingly convinced that a terrible fate awaits them all. Paul Hyett has a date with werewolves on a train in Howl! Nothing more frightening than a child as the aggressor. Should be a fun flick to check out at TIFF. No kidding! I really like how it’s essentially kids vs. a kid. Should be fun! I see The Pact 2 has dropped into my iTunes queue…. curious…. know anything about it? All I know is that McCarthy isn’t back to direct it and the trailer was a little rough around the edges. Let me know how it is! Yeah, that’s probably a good idea lol. For $15.00 it better come with a BJ. I Hate Seeing Kids Killed Off. But Those Kids Sound Like Scum So I May Enjoy That. Haha, yea that certainly helps doesn’t it?